The slope calculator allows you to calculate the angle of a slope, that could be the angle of your driveway, the pitch of a roof, the angle of a hill etc. Slope calculations are particularly useful for ensuring that water flows correctly off a surface and for reducing stress, friction and energy when moving heavy objects using a ramp. A Slope is defined as an inclined portion of ground, and is also known as a "Grade". 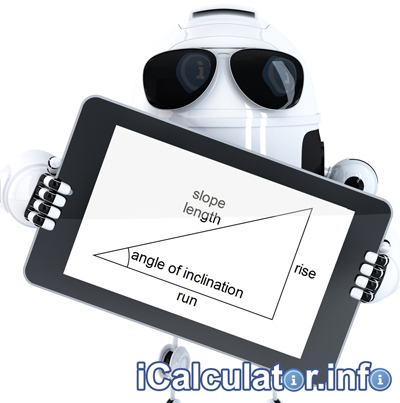 It can be specified in 4 different ways, angle of inclination, percentage, per mille and as a ratio. Note: The ratio is specified as "1 in n" rather than the mathematical "1:n". You may also be interested in the Gradient Calculator. Angle of Inclination The angle opposite the "rise" side of a triangle with a right angle between the vertical "rise" and horizontal "run"
Percentage The relation ship between "rise" and "run" expressed as a percentage. In the U.S. this is commonly used for communicating slopes in transportation, surveying, construction, and civil engineering. Per Mille The tangent of the angle of inclination times 1000. Commonly used in Europe to denote the incline of a railway. Ratio The ratio of "rise" (expressed as "1") to "run". Specified as "1 in n" rather than 1:n. This is generally used to describe railway grades in Australia and the UK.